If you’ve spotted white mold in basement, or any type of basement mold, you may be wondering what it is and what to do about it. Any type of mold, regardless of color, is cause for concern because inhaling the microscopic mold spores can cause health problems, including respiratory problems and allergic reactions. Some types of mold are of more concern than others, though, because they produce harmful substances called mycotoxins that can cause a number of medical problems, some quite serious. Many types of mold can appear white in color, depending on the type of material on which they are growing, including aspergillus, cladosporium, and penicillium (penicillium is often blue or bluish-green and white). Mildew, a type of fungus similar to mold, may also appear white and powdery. 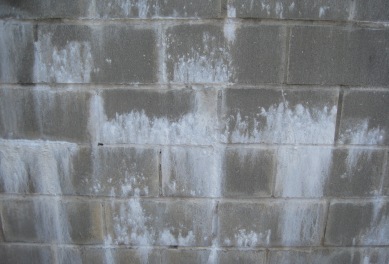 People sometimes confuse efflorescence with white mold. Efflorescence refers to salt deposits found on concrete and masonry surfaces when water has seeped through the concrete, brick, or stone. The water evaporates, leaving behind salt deposits that look a lot like white mold. Unlike mold, however, efflorescence is easy to remove and it doesn’t cause any health problems. All types of mold can cause health problems, though some types are associated with more serious health risks than others. Health problems commonly associated with exposure to white mold include difficulty breathing, asthma attacks, chronic sinus infections, bronchitis, pneumonia, migraine headaches, chronic sore throats, skin rashes, hives, exhaustion, and general malaise. If you’ve noticed white mold in basement, it’s important to get it cleaned up as soon as possible to prevent mold-related illness and to prevent mold from spreading to other areas of the home. Many types of white mold spread quickly and easily from one area to another, so if you discover white mold in your basement, you need to inspect your entire home for mold. You can purchase mold removal products at most home improvement stores, such as Foster 40-80, that will remove mold from non-porous surfaces like metal and porcelain. It can be difficult to remove mold from semi-porous surfaces like concrete, though, and it’s often impossible to remove mold from porous surfaces like drywall and carpeting. Things like drywall, carpeting, and ceiling tiles usually need to be removed and replaced. 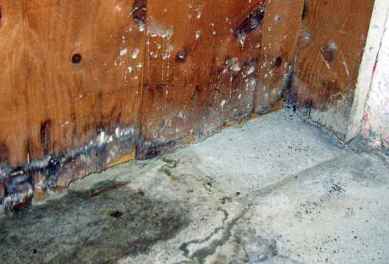 Since you often cannot remove and replace moldy concrete, it must be carefully cleaned. Sometimes a sealant is then applied, to prevent any remaining mold from continuing to spread. For a more details on mold cleaning and encapsulation products, follow the link. If removing mold from your basement sounds like a lot of work, that’s because it is. It must be done carefully in order to avoid spreading mold spores to other areas of the house and to avoid the inhalation of mold spores, which can cause serious health problems as described above. If you’re experiencing any mold-related health issues, or if you suffer from any conditions like asthma or immune system disorders, it’s recommended that you not try to clean up mold yourself because you may end up making your condition worse. The Environmental Protection Agency also recommends hiring a mold removal professional if you have mold covering an area greater than ten square feet or if you have mold in heating and air conditioning ducts. We recommend scheduling a free consultation with a mold removal professional that will come to your home, inspect the premises, and write out a mold remediation plan including safety protocol. Even if you end up opting to handle the job yourself, you’ll benefit from some free professional advice. Follow the link for a list of mold removal specialists in your area.